Eighty percent of YouTube traffic comes from outside the U.S., and 60 percent of that traffic comes from countries where English is not the primary language. YouTube is undoubtedly the largest online video provider online. But what you may not know is just how international the content and consumers are. Eighty percent of traffic to the site comes from outside the U.S., and 60 percent of that traffic comes from countries where English is not the primary language. 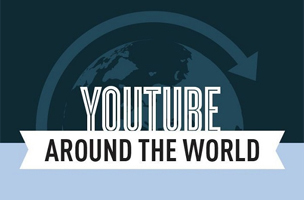 The world’s most avid YouTube users come from Saudi Arabia. The country contributes 90 million views every day, 50 percent of which come from smartphones. With government censorship of television, Facebook and Twitter, viewers have turned to the unrestricted YouTube for their entertainment. The U.K. also puts in a strong showing. Thirty-five percent of U.K. residents are active on YouTube, and 18- to 24-year-olds make up 76 percent of all users. YouTube is so popular that it accounts for one in four social media hits in the country.